Whenever customer places an order that order is save in magento admin in Sales orders as a normal order plus it also saves it in our seller relation. Seller can only view/manage those products from the order only which they sell. 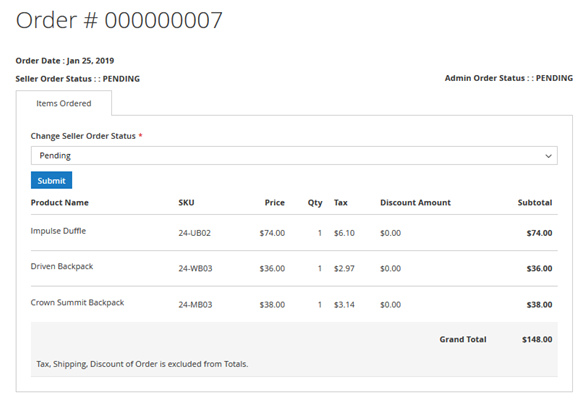 On click of View order seller can view only products it sells in that order. Seller Order Status – It is that order status set by seller for this order. Admin order Status – Status set by admin for whole order. 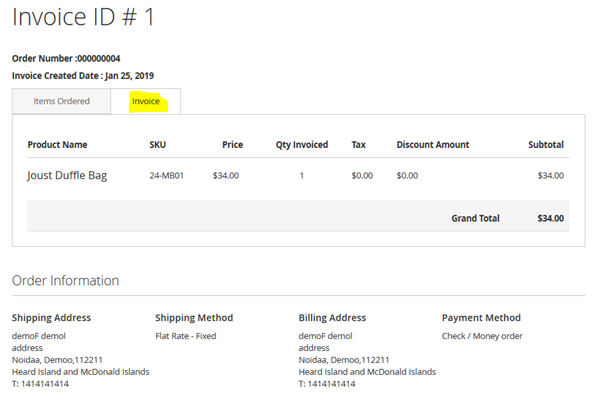 Change Seller Order Status– Seller can only change Seller order status from this dropdown. Changing this order status will just reflect seller order status. Further order processing has to be done by admin only. Products list – Products assigned to that seller only. Grand Total – Total of only for this particular seller. Note – Grand Total doest include any Tax, Shipping, Discount applied to whole Main Order which was there when customer placed the order. Seller can also view following data for the order. 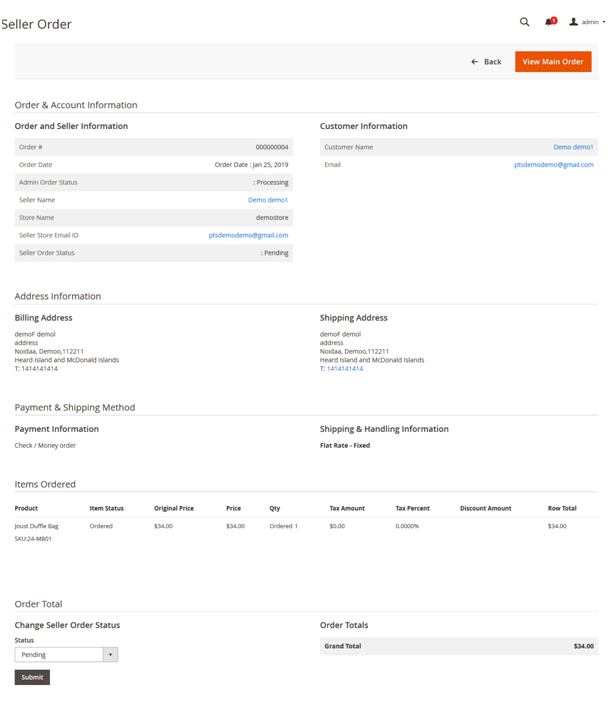 Seller can generate Invoice of the seller order for their products only. Invoice can only be generated once Admin has processed the order. Only after then Seller can generate Invoice when admin has already Generated invoice of the order. Seller can view list of products and all the details while generating Invoice and can also add comment to Invoice. 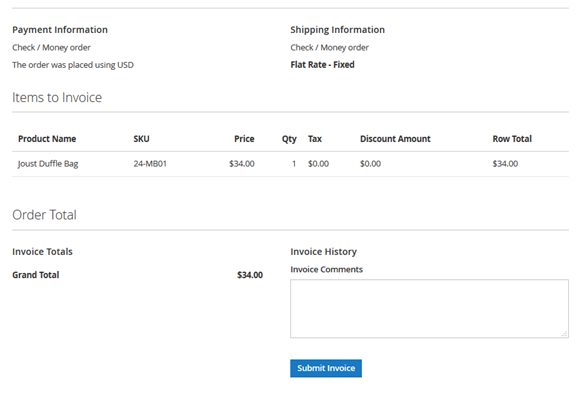 When Seller invoice generated seller can view generated invoice from Invoice Tab on Order view page. Admin Can manage main order received from customer and also seller order. Order processing for main order is same for the admin as it is done in default. For seller orders admin can view seller orders from Marketplace > Manage Orders. In Seller Order Status view admin will see single order from one seller only. Admin Can change Seller order status. Main order must be Completed before completing seller order to get admin commission. Seller Order status has to be set again even if seller has already marked it Complete to get commission. Admin can go to main order fromView Main Order from top right. Order Total in here is only Total of the seller orders. More details of Multivendor Marketplace for Magento 2 can be found here.